All transactions are safe and secure with a reliable history in online purchasing behind each of our associates. 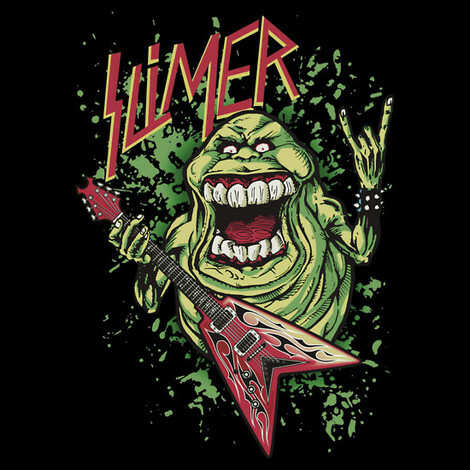 Buy the Ghostbusters Slimer t-shirt to own Ghostbusters clothing and merchandise. These Slimer Ghostbusters t-shirts are a great way to let everyone know that you ain't afraid of no ghost. The front of the tee displays Slimer, a ghost with an appetite for both food and destruction. Slimer is the first ghost that the team captures, but not before the little green menace slimes Venkman. Whether you would keep Slimer as a pet or zap him with your Proton Pack, this Slimer t-shirt is perfect for the parapsychologist in us all. In addition to the Ghostbusters Slimer tee above, browse the Ghostbusters Clothing Gallery for more apparel like men's and women's clothes, kids shirts or hoodies.